I've recently gotten hooked on the wildly popular (among gearheads) BBC-produced show "Top Gear." One of the reasons why the show is so entertaining is the deliberate sense of drama and excitement that they manage to write/edit into each segment. Realizing that visual hyperbole is what drives the show doesn't detract much from its entertainment value. One of the more well-known dramatic sequences featured host James May driving the mythical Bugatti Veyron along the 5.5-mile level straight of Volkswagen's own closed test track in an effort to reach the car's top speed of 253mph (you can view the video on Top Gear's web site here). May waxes eloquent about the car's brutal, 16-cyclinder, quad turbocharged, 1,000hp engine and the impressive, 21st Century engineering that went into the $1.4 million supercar. In the segment's introduction, he says, "The Veyron is about pushing the outside of the envelope. It's about doing things that people said just were not possible." The segment hyped May's top speed attempt as something almost as dramatic as the first moon landing. Visceral. Perhaps bound to end in tragedy. Uncertain. A technological triumph. Uh-huh. Well I've got news for Mr. May and the gaggle of producers at "Top Gear"--they're about 45 years too late. The vehicle you see here went 255mph on a straight, level track twice--once in each direction--in order to claim a world speed record for vehicles in it's class. Oh, and the year was 1963. The following year, it broke it's own record by setting anew record in excess of 263mph. Based on the technology that went into the Veyron, you'd think that the engineering effort and money invested into such an effort over 40 years ago must have been astounding. Actually, not so much. 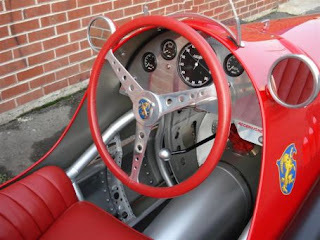 What makes this car, and others like it of the same era, so amazing is the ingenuity that went into them. 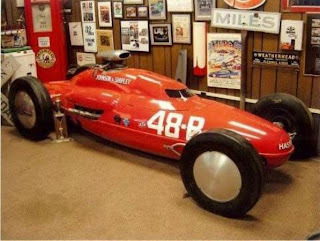 This car was actually built in 1955 by a small racing shop in Southern California called Car Craft Machine. They used bits and pieces from a gaggle of disparate vehicles--along with the aluminum belly fuel tank from a P-51 Mustang fighter plane--that succeeded in setting multiple world speed records. 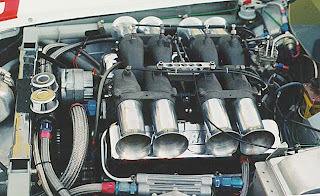 And the engine was no 16-cylinder behemoth with four giant turbochargers, it was a 331ci Chrysler Hemi V-8 with a GMC supercharger bolted to the top. That amazes me. Anyone who thinks James May was brave for his top speed attempt in the Veyron, should consider Don Johnson, the driver of this car during it's record-setting runs in '63 and '64, to be a justifiable hero. But I'll bet none of you have heard of this man who squeezed himself into a tiny aluminum teardrop and streaked across the salt flats at Bonneville, Utah so many years ago. I hadn't until now. Why did he do it? 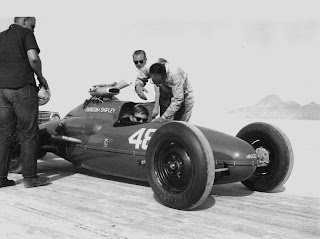 He and all the other speed freaks that would show up--and still do--at dry, flat lake beds in the Western United States each year in order to do one, single thing: push the outside envelope of their cars in order to see just how fast they can go. And there's absolutely nothing contrived about the drama involved in their efforts. It's the real deal. 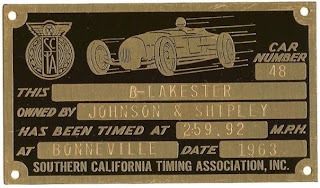 This 1955 Johnson & Shipley B-Lakester, #48-B, is part of a private collection is listed for sale here on RacedandRallied.com. Being of Italian ancestry, I take great pride in that country's obsession with fine, fast automobiles. 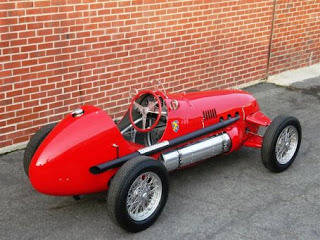 As mentioned in a previous post, I have a particular fondness for Alfa Romeo. But in addition to the famous marques such as Ferrari, Lamborghini, and Alfa, there have been other smaller Italian builders who were just as passionate about motoring excellence. 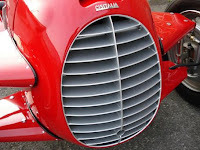 One of those was Cisitalia. Like Fiat and Alfa Romeo, the name Cisitalia doesn't actually mean anything--it's an Italian acronym that stands for "Consorzio Industriale Sportive Italia" and was founded in the motoring hotbed of Turin in 1946. 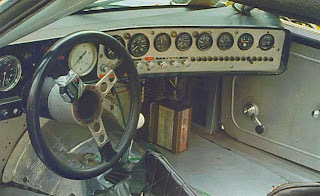 The car you see here was the company's first serious foray into the world of international Grand Prix racing, the D46. 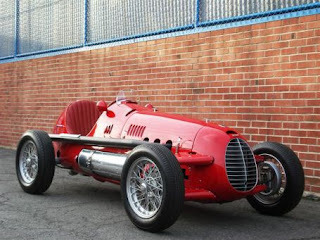 Although not particularly successful as a racing car, to my eyes the D46 is a showcase of the innovation and attention to detail that made Italian automotive engineering of that era into a quasi-art form. The overall proportions are nearly perfect, with details like the tightly-faired front suspension only accentuating the graceful lines. It amazes me how a 60-year old car like this can still cause my eyes to bug out. 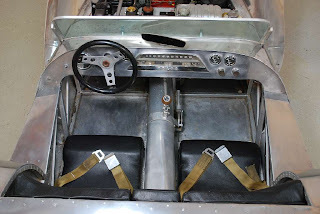 It hearkens back to an era when engineering, art, and not a small dose of pure, intuitive genius combined to create machines that men pushed to the absolute limit...and sometimes beyond (note the lack of roll cage and seat belts on this car). The car is for sale on Autotrader Classics here. Magnifico! Who's Afraid of the Big, Bad 'Vette? Among newer Corvette enthusiasts, thoughts of after-market performance tuners will conjure names like Callaway, Lingenfelter, Mallett, and Specter. But all of these mavens of fiberglass and speed are following in the footsteps of the original Corvette go-fast gurus, John and Burt Greenwood. 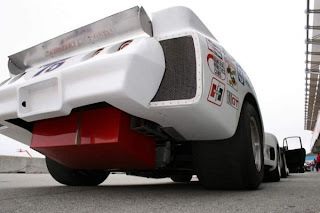 The Greenwood team rubbed shoulders with the likes of Zora Arkus-Duntov and Gib Hufstader, who provided factory parts support for Greenwood's Corvette racing development in the early 1970's. 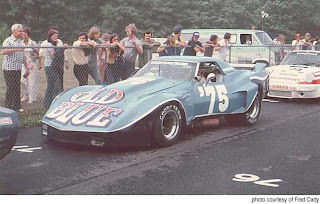 This car was really the first of the famous 'wide-body' full-frame Corvette race cars, even though it carries chassis number 02, which were introduced in 1974. Purpose-built for IMSA and SCCA, the car was raced with great success under many different names and color schemes during the 1974 IMSA season, and it's on-track prowess during the 1975 season earned it the lasting moniker "Spirit of Sebring '75". 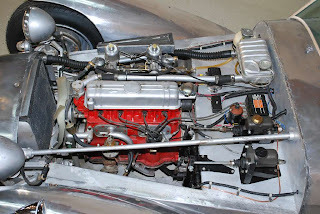 The car served as Greenwood's test bed for the subsequent wide-body cars and was the first to have the new, flared wheel wells, the Kinsler cross-ram Lucas fuel injection system, and Bob Riley coil-over suspension on all four corners. During the '74 and '75 seasons, the wide-bodied cars dominated IMSA--relegating Porsche's and BMW's to eating Corvette-induced dust. John Greenwood himself said that the #02 car was the fastest of the early wide-bodies and is the car that he drove to victory at Daytona in the 1974 IMSA final. Other drivers to race behind the wheel of #02 were Sam Posey and Milt Mintner. It eventually was sold off and forgotten, only to be rediscovered by Greenwood aficionado Lance Smith. 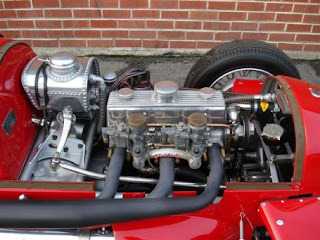 Smith purchased the car and restored it to its original glory. It's currently offered for sale on RaceCars.com here. You can also read about the car's history here and the wide-bodied cars in general here. 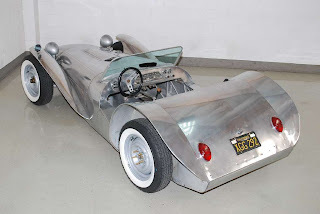 What do you get when you cross styling a-la Lotus 7 with running gear from an early '60's Volvo PV544 with the aluminum drop tank from a North American F-100 Super Sabre fighter-bomber? 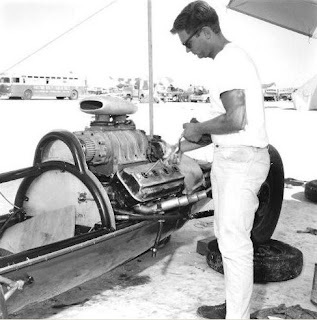 Well, I'm sure it's a question that crosses every gear-head's mind every day...or at least it crossed the mind of Al Hoyt, who built the car you see here with help from his son, Mike, in 1961. They raced this car in SCCA F-modified autocross at Elkhart Lake/Road America. 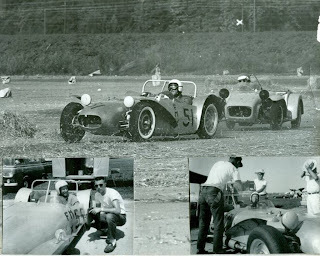 They also raced at the occasional USAF base, where the car must have felt right at home given its aeronautical roots. I love the silver aluminum body with a front air dam modeled after the airplane that the metal came from. The original, 1.6L 4-cylinder Volvo motor breathing through dual carbs feeds power through a 4-speed gearbox to a limited-slip diff. The entire package looks like an absolute blast to drive. There's quite a grass-roots movement today built around the 'Locost' concept, and this car had to be one of the first! Completely restored--down to the original Volvo linear speedo and steel wheels--the car is 100% street legal. The car would be perfect for anyone wanting to do some vintage racing or anyone looking for more excitement on those weekend bread runs! The car is listed for sale here on AutoTrader Classics, although why it's listed under 'Austin Healey' is beyond me.